Measurements: 2.65 x 4.75 inches, or 66 x 120 mm. Back of card: Ornate blue & white line drawing of a peacock in a fanciful forest. Overall similar to a traditional playing card & though it's not symmetrical, you can invert. Booklet included: No. As with most Lo Scarabeo decks, there are 9 extra cards with instructions in English, Italian, French, German & Spanish. Comments: The Italian name of this deck is I Tarocchi di Vetro. My Italian is weak but my French is good. The same word in French is verre, which means glass but not quartz (rock) crystal. Presumably the term, vetro, might also means lead crystal, a kind of glass. As always, this publisher is mute on the purpose of the deck, but many of the cards feature that same color of green you see on cheap bottle glass. Any Italians want to help out? This is in most ways a standard tarot deck. 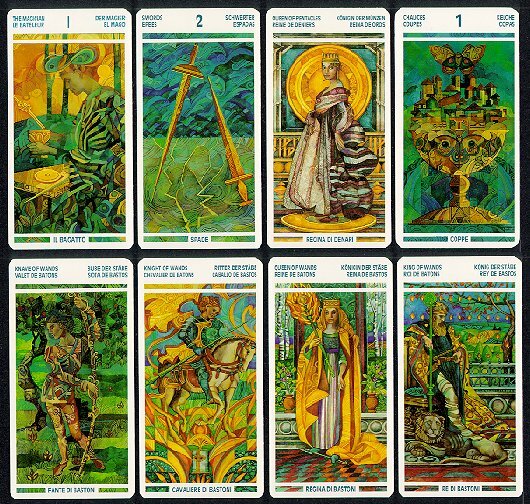 The bottom row are all four court cards from the suit of Wands. There's nothing exceptional in the progression from Knave to Knight to Queen to King in any of the suits in this deck. I just thought you might like to see how an artist handles court cards as a unit. And for the most part, pip cards are mere pips (as the two of swords, above), which don't make for such great illustrations.